I spoke last week on Facebook that I have a dress in mind for an upcoming convention, and while it would fit now (and look great), I think it would fit so much better with a few inches gone here and there. Am I overweight – most probably. Do I look it – probably. Am I happy – most definitely not. So here we are at Day 1. I can accomplish this by dialing back my training and making a more concerted effort to just MOVE every day – EVERY DAY – no more days off for rest, snow, Sleepy Hollow. This means I will do my core workout every day. This means I will get on the treadmill every day, but I won’t push myself to exhaustion to crack a certain time or mileage ceiling. I still want to hit my personal goal of 300 miles ran in 2014, I just may not hit all of them with an averages pace of 11.5 min/mile. I don’t want to sabotage myself by grabbing a snack before hitting the gym or the course and then quitting because I feel full or bloated. It also means we haul out the bentos, which seems to be fan favorite anyway. This should work especially well as we creep towards Lent and a restart of the 40 Days of Bento. 40 Days is a big chunk of 100, but I’d like to carry over the good and pretty eating through the weekends. We could stand to eat less pizza and more salmon, less pasta and more veggies. Within the next 100 Days, I’ve got two weeks of later work shifts, a convention and other bit of craziness that tend to derail things like goals. Plus, all of my favorite shows are either going into season finale status or season premier. Planning, planning, planning. I want to do this. I welcome (today anyway) pokes and prods. I also welcome company, if anyone wants to hop on board. I’m even going to post measurements – arms, bust, waist, hips – since that’s what’s going to determine the size of the dress I’m after. I can’t post my weight because I don’t have an accurate scale (and don’t really want one), but if I want to be honest with myself, a whiteboard on the wall isn’t going to cut it. Brave, stupid, insert your own adjective here – whatever. Online I can be whatever I want (Finnish, size 2, fluent in Navajo), but the reality is I don’t want to be one of those pretty girls who become wheelchair bound with cankles the size of medicine balls as she approaches middle age. I had a great Aunt like that, former beauty queen turned cautionary tale. My own vanity won’t allow this. 6 inches in 100 days (April 30). 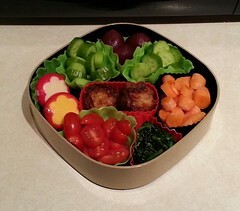 Beets, mini cucumbers, mini Babybel cheese (light, cheddar), coconut-oil fried shrimp shumai, raw carrots, grape tomatoes, garlic-sautéed spinach.